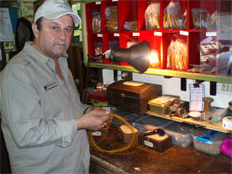 I make my natural silk fly lines using innovative methods and in full respect of the principles of traditional fly fishing. There are dedicated to all fishermen who seek tradition and wish to complement their precious bamboo rods and wooden reels. These fishermen spend many pleasant hours along the rivers making long, smooth casts and elegant presentations. For this kind of fisherman, it is important to have a very supple line that floats very well and many of them write to me letters of satisfaction, describing how thanks to their characteristics, they can fish many different kinds of rivers. Silk lines are appreciated for different reasons. With respect to the same weight PVC line, they have a much smaller diameter and due to this they slide better through the guides. Furthermore, they are treated with an external non plastic and malleable dressing, that auto-regenerates with the mere heat of the hands and once it wears off, reveals a very high quality silk which is soft and pleasant to touch and to look at. These silk lines are very durable and will reach a high degree of floatability by following a few simple rules during maintenance. If you are a purist with a passion for traditional equipment and you have decided to embellish yours with my lines, you will also receive two leaders: a 1,5m one and a 2m one and a pack of specifically formulated line dressing. With correct use and an adequate maintenance, the natural silk lines I make, can last over 20 years. Why wait? Order your silk line immediately and relive the poetry of the past with every cast.